The Pops Gustav Archive: They're STILL Coming to Get You, Barbara! Cinematic trends come and go, especially in popcorn movies. Some of them unexpectedly resurrect, like the mini western boom of the late 1980’s, and then go away, seemingly for good. And there are some genres that just won’t stay dead... ah, you know where we’re going with this, don’t you? While Thomas Edison never made a two-reeler called “Blood Draining Zombies Eating Skin,” it wasn’t long before the walking dead shambled onscreen. The first actual zombie movie was 1932’s “White Zombie ” (yes, that’s where Rob got the name for the band) starring Bela Lugosi as Murder Legendre (where’s the band with THAT name? ), a voodoo priest who raises the dead not so they can feast on flesh, but to be used as cheap labor in a Haitian sugar mill! No doubt some large American corporations have tried this cost-cutting device as well (who knows, perhaps the living dead made your sneakers). Lugosi would appear in more zombie films as his career decomposed, including “the Corpse Vanishes ” (1942), “Voodoo Man ” (1944), the comedy “Zombies on Broadway ” (1945) and who can forget Ed Wood’s 1958 “classic,” “Plan 9 from Outer Space .” with Tor Johnson as the most unthreatening, lumbering zombie in the history of the genre? Of course, while tons of movies featuring zombies (most of them made for slightly less than your annual candy bar budget) continued to come out through the forties, fifties and sixties (with names like “Zombies of Mora Tau ,” “Teenage Zombies ,” “Night of the Ghouls ,” and “The Incredibly Strange Creatures Who Stopped Living and Became Mixed-Up Zombies ”) none of them featured the buckets of blood and guts we’ve come to expect from that genre today. 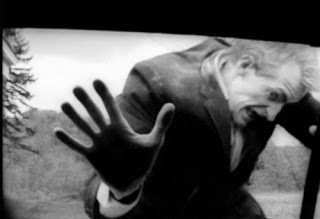 The 1952 serial, “Zombies of the Stratosphere ” didn’t feature any zombies at all and 1964’s “I Eat Your Skin ” had, you guessed it, no ingestion of any flesh. Not even a burger. It wasn’t until a tiny little independent black and white movie came out in 1968 and completely redefined the genre. B-Movie king George Romero’s “Night of the Living Dead ” with its stark, simple visual style that stood in startling contrast to the content, instantly became the most unsettling horror movie to date. Groundbreaking (no pun intended) in its casting (Romero made the hero a black man), cinematography and effects (oh, flesh was eaten in this one), “Night” holds up spectacularly, 36 years later ,so much so that the 1990 remake by Tom Savini is as superfluous as Gus Van Sant’s 1998 retread of “Psycho ”. Romero released two sequels, 1979’s “Dawn of the Dead, ” which amped up the blood as well as the satire by making the setting a Pennsylvania mall. Okay, so it wasn’t subtle satire, but not too many films were mocking America’s blind consumerism at the time. By 1985’s “Day of the Dead ,” the zombies had pretty much taken over the world, with just a handful of scientists and military holed up in Florida trying to figure out how to salvage what was left of civilization. Yeah, Florida’s the place to do that. Among horror fans, there’s another series that, while not completely zombie-centric, is at least as highly regarded as Romero’s “Dead” films, and that’s the “Evil Dead” trilogy . Inaugurating the “film-as-roller-coaster-ride” metaphor, 1981’s “The Evil Dead ” was so audacious in its bloody excess that many people couldn’t tell if it was a horror or a comedy. The genius of the film was that it was, in fact, both. Director Sam (“Spider-Man ”) Raimi and his star, Bruce Campbell re-teamed for two more “Evil Dead” installments. “Evil Dead II ” (1987) wasn’t so much a sequel as a big(ger) budget remake. 1993’s “Army of Darkness ” transports Campbell’s chainsaw-appendaged hero Ash to the 14th Century to do battle with an entire army of the dead in order to regain the Necronomicon, the Quickstart guide to raising evil spirits that got the whole series rolling in the first picture. There are about a hundred different versions of this series out on DVD, so choose wisely. If you buy the wrong one, you may set loose an evil side you didn’t even know you had. The horror / humor hybrid started with those movies and seen in “Shaun of the Dead” was also evident in “Dead Alive ,” the 1992 horror-comedy directed by multiple Oscar winner Peter (“Lord of the Rings”) Jackson. Poor Mama’s boy Lionel has enough trouble with his domineering mother BEFORE she gets bitten by a rat monkey and becomes a flesh hungry zombie, so you can imagine how difficult she is to deal with after she starts eating everyone in sight. Some have called “Dead Alive” the goriest movie ever made (at least before “Passion of the Christ”). Similarly, 1985’s “Re-Animator ” (based on an H.P. Lovecraft tale) elicits laughter on the verge of shock. Jeffrey Combs plays Herbert West, a medical student who creates an elixir that can not only bring corpses to life, but severed body parts as well. The movie is best remembered for a scene we can’t describe here. But it takes a sexual euphemism to a literal extreme that had audiences shaking their heads in disbelief. The 1989 adaptation of Stephen King’s “Pet Sematary ” brought something new to the formula: adorable zombies! The Creeds (no relation to the band) move to rural Maine, right by a road that traffics in speeding tractor trailers and right near an ancient Indian graveyard that resurrects those buried there. When the Creeds’ kitty goes splat, he is resurrected with seemingly no side effects. However, when the toddling young son meets the same fate, he comes back as an evil, scalpel wielding, murderous... but still cute as a button.... zombie! The movie is mostly memorable for some eminently quotable lines (“Now I wanna play with youuuuuuu!”) and Fred “Herman Munster” Gwynne’s performance as the wise, yet doomed neighbor Jud. The “Cult DVD” section of your local mega-video store has tons of low budget zombie movies... like 1961’s “Blood of the Zombie ,” the 1974 Italian/Spanish feature “Let Sleeping Corpses Lie ,” 1985’s “Return of the Living Dead ,” and its sequels, which upped the anxiety by making the living dead completely invulnerable (Romero’s zombies just needed a bash to the brain to stop them in their tracks). Then there’s “Gore Whore ” from 1984 (hey, that rhymes! ), 1987’s “Night of the Living Babes ,” a super low budget flick with “hot zombies,” “Redneck Zombies ” from that same banner year, “Chopper Chicks in Zombietown ” (1989), and... literally... hundreds more. Anything’s possible. After all, who would have ever guessed that the guys who made “The Evil Dead” and “Dead Again” could become two of the most celebrated sought after directors in movies? Turns out the path to Hollywood respectability is sometimes paved with upturned tombstones, severed limbs and exploded heads.